Here's an example of one of my cartoons. 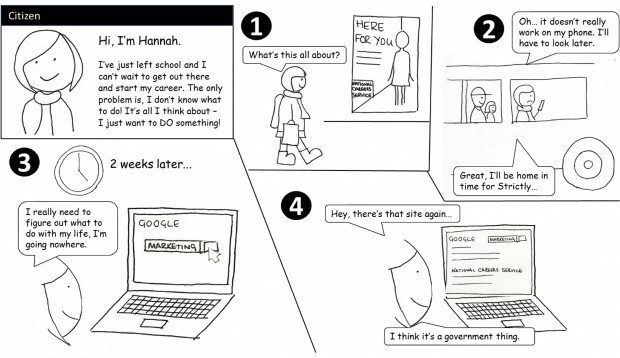 Hannah’s journey: how it SHOULD be! I wanted to get my stakeholders to start thinking about the real person using our services. That might be a 17-year old browsing our site on her phone while on the bus, or a small business owner trying to find out about apprenticeships in a half hour gap between meetings. A few months ago, as part of some strategy planning at the Skills Funding Agency, I started sketching cartoons. 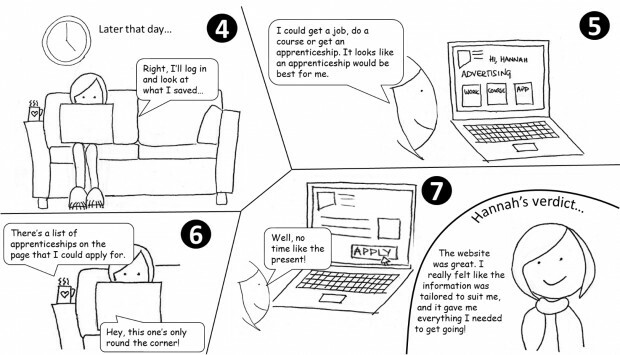 I found that cartoons illustrated the user journeys in a more personal way, and really helped people identify with our users. Stick men are fine as long as they have something, like a hairstyle or item of clothing, to identify them with your user persona. The important thing is to get your audience thinking in the right way. Cartoons work best when they’re used to start a conversation, or to illustrate a high level point rather than to capture a detailed user journey. My cartoons aren’t in the league of Bonny Colville-Hyde. Hopefully, though, they show that anyone can create something simple to get people thinking on a user level, rather than a process or policy level. Bonny's coming to our next cross-government user research meetup to show us how she makes and uses cartoons to communicate research. If you're doing research in government and would like to come along, email Leisa and we'll add you to our email group. Also, if you've used cartoons (or other creative techniques) in communicating research, we'd love to hear from you. Drop a line in comments. Thanks Vanessa. Great work! 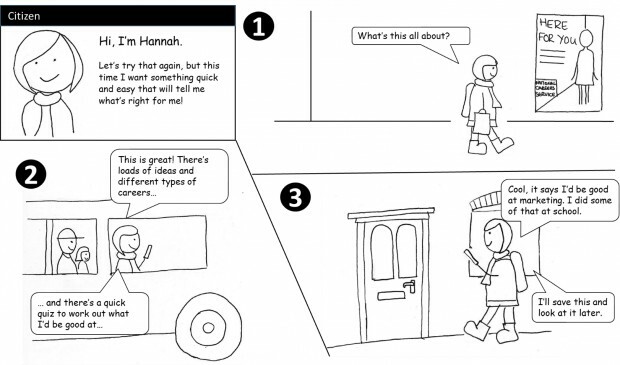 Your cartoons pull the stakeholders into Hannah's world; the complexity, the confusion, the intermittent attention points. They illustrate the issues beautifully. Also, I think they bridge the empathy gap - who would not empathise with the heroine here? Who would not feel motivated to solve her problems? They would harden the resolve to do the knotty work necessary to deliver scenario #2 for her. On occasion, I've used real actors to play UX scenarios in front of stakeholders. The trick is to get the stakeholders to then act out scenarios. For some stakeholders, it liberated their thinking, helped bridge the empathy gap, uncovered novel insights and played a part in motivating them to make stuff. But I don't think it's the right tool every time. Thanks for your comment - I think you've hit the nail on the head there, empathy is what I'm trying to get out of this. My stakeholders find it so hard to really care about the users on a personal level, especially with our B2B services. Real actors sounds fantastic! I'd love to see that in action if you ever do it again. 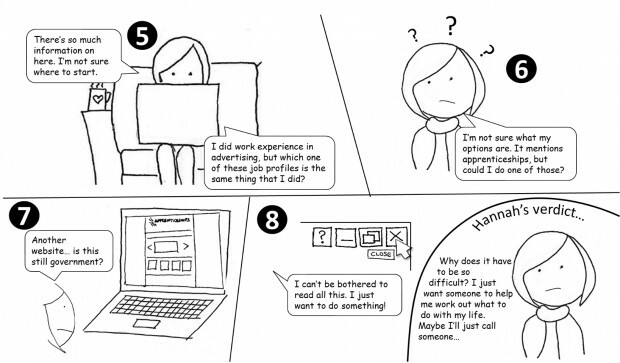 We also use storyboarding over at Spotless for ux research! Great tips, thanks. I like the look of Comic Life, I'll give that a go - I currently just draw on paper and scan it into PowerPoint which is fiddly, so this looks like it'll make life easier. Here is one of the most popular conference presentations I have done. I used prezi to work through a BitStrips cartoon, and I still have people commenting on it a year later!